In a week that saw Sarah Palin’s youngest child attacked by Alaska’s official Democrat National Committee blogger in an attempt to raise money to fund more personal attacks on the Governor, Palin finds herself pretty busy. She was on a “secret trip” to a foreign land. First stop was visiting the troops participating in Northern Edge 2009, Alaska’s largest military training exercise. Governor Palin and her husband first met with Lt. Gen. Dana T. Atkins, Alaskan Command Commander, 11th Air Force; and Rear Admiral Mark A. Vance, USS John C. Stennis (CVN 74) Strike Group Commander, before heading out to the USS John C. Stennis. From there it was a short trip over to the USS Stennis to observe the exercises. The troops Governor Palin is visiting are members of the Alaska National Guard. There is some cool raw video of the Governor landing and making some comments. One notes she carries her own gear. Given the current situation in America, I’m not sure the Governor could have picked a better Reagan quote to use. Here is a full version of her speech. At the end she gets a little shot in at Senator John Kerry, who served in Vietnam, much to the delight of the troops. This was a bit of payback for Kerry’s poor attempt of a joke made earlier in the week. Kerry has made a habit out of this sort of thing over the years. 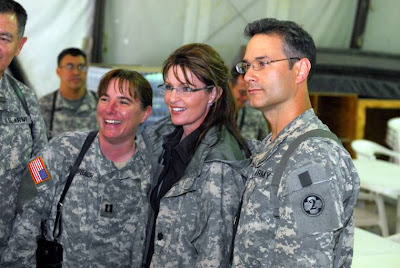 I’m sure detractors will have something to say about all of this, but the fact is, Governor Palin takes her job as Commander-In-Chief of the Alaska National Guard and the Alaska Defense Force very seriously. The Governor made her first trip overseas to visit her troops in 2007, not long after her election. Being a lifelong hunter, she even took time to get in a little weapons training while in Kuwait. As longtime Guard commander Major General Craig E Campbell pointed out in a September 2008 interview with Fox New’s Greta Van Susteren, Palin is one on the ball C-I-C. Saying that she was one of the best he had served under. That she actually cares about her responsibilities to the Guard. In addition to the normal duties, Palin makes a point of attending every overseas deployment ceremony, and is at the airport to greet every single returning serviceman and servicewoman. Alaska’s National Guard is unique, as it is the only state force that is on permanent deployment. The 176th Wing, of the Alaska Air National Guard trains with and is part of the United States Air Force. They are vital to our air defenses, and are the first line of defense should Russia, North Korea, or China decide they want to become aggressive. Governor Palin has has shared strategic command of the 49th Missile Defense Battalion.. And also commands the Alaska Defense Force, a federally recognized militia that is part of Homeland Security’s strategic plans. Palin also enjoys a top level of security clearance and receives regular security briefings. Alaska is home to much of our missile defense systems. Governor Palin has been one of President Barack Obama’s strongest critics as he seeks to make major cuts in our missile defense dollars at the same time North Korea is fueling up long range ICBM’s and threatening nuclear war. North Korea is threatening a missile launch on the 4th of July with Hawaii as the target. The Governor’s next stop will be Germany. This entry was posted on June 27, 2009 at 6:54 AM	and is filed under Alaska, Alaskan Foreign Policy, Barracuda, Children with Special Needs, Conservative, Conservative of the Year, Down Syndrome, Family, favorite, GOP, Governor Palin, Governor Sarah Palin, Hate and Misogyny against Palin, liberal bloggers, misogyny, National Defense, North Korea, Obama, President, Republican, Ronald Reagan, Sarah Palin, SARAH PALIN PHOTOS, SARAH PALIN VIDEOS, SarahPAC, special needs, special needs children, Todd Palin, USA., Woman. Tagged: Alaska Defense Force, Alaska National Guard, First Dude, Kosovo, Kuwait, linda kellen biegel, Sarah Palin, Todd Palin. You can follow any responses to this entry through the RSS 2.0 feed. You can leave a response, or trackback from your own site.